The KA-BAR Jarosz Globetrotter is a simple and effective fixed blade utility knife. Its versatile drop point shape gives it a lengthened cutting belly and a sharp tip, and it comes with a flat-ground plain edge and a wear-resistant dark finish. The handle is made from tough, lightweight Ultramid, which is highly durable and resistant to water and chemicals. Its slight curve fits the hand naturally for increased comfort during use. 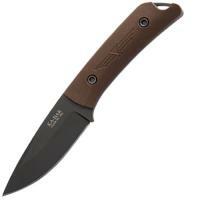 The knife has its own durable polyester sheath, equipped with a snap-fastened retention strap for increased security. It is MOLLE-compatible, making it easy to carry on a wide range of clothing and equipment.